The Appalachian National Scenic Trail, generally known as the Appalachian Trail or simply the A.T., is a marked North Carolina, Tennessee, Virginia, West Virginia, Maryland, Pennsylvania, New Jersey, New York, Connecticut, Massachusetts, Vermont, New Hampshire, and Maine. 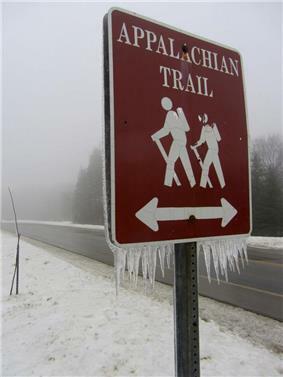 The path is maintained by 31 trail clubs and multiple partnerships, and managed by the National Park Service, United States Forest Service, and the nonprofit Appalachian Trail Conservancy. The majority of the trail is in forest or wild lands, although some portions traverse towns, roads and farms. The trail conservancy claims that the Appalachian Trail is the longest hiking-only trail in the world. The Appalachian Trail is famous for its many hikers, some of whom, called thru-hikers, attempt to hike it in its entirety in a single season. Others have managed to perform a "round-trip" of the trail where they thru-hike from one end to the other and then turn around to thru-hike the trail the other way, otherwise known as a "yo-yo". Many books, memoirs, web sites and fan organizations are dedicated to these pursuits. An unofficial extension known as the International Appalachian Trail continues north into Canada and to the northern end of the Appalachian Mountain range, where it enters the Atlantic Ocean. Other unofficial extensions continue the southern end of the Appalachian range in Alabama and continue south into Florida, creating what is known as the Eastern Continental Trail. The trail was conceived by Palisades Interstate Park Trail Conference as their main project. 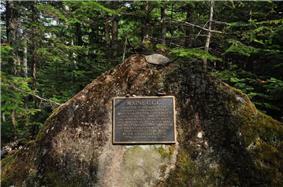 Marker on the trail near Mount Sugarloaf in Maine commemorating its completion. Avery became the first to walk the trail end-to-end, though not as a thru-hike, in 1936. In August 1937, the trail was completed to Sugarloaf Mountain in Maine, and the ATC shifted its focus toward protecting the trail lands and mapping the trail for hikers. The International Appalachian Trail is a 1,900-mile (3,100 km) unofficial extension running north from Maine into New Brunswick and Quebec. 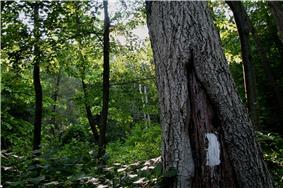 It is a separate trail and not an official extension of the Appalachian Trail. Although the Appalachian Trail ends in Georgia, the Appalachian Mountains continue south to Flagg Mountain in Alabama. In 2008, the Coosa County, 50 miles (80 km) east of Birmingham. In 2010, the Alabama state legislature formed the Alabama Appalachian Mountain Trail Commission in 2010 to provide state resources for trail improvements, although officially designating Pinhoti as part of the Appalachian Trail would require an act of the United States Congress. The American black bear (Ursus americanus), among the largest animals along the Appalachian Trail, rarely confronts people. The black bear is the largest omnivore that may be encountered on the trail, and it inhabits all regions of the Appalachians. Bear sightings on the trail are uncommon, except in certain sections, especially Shenandoah National Park and portions of New Jersey, New York, Connecticut, and Massachusetts sections, where bear populations have increased steadily since 1980; confrontations are rarer still. Other hazards include venomous snakes, including the Eastern timber rattlesnake and copperhead, which are common along the trail. Both snakes are generally found in drier, rockier sections of the trail; the copperhead's range extends north to around the New Jersey–New York state line, while rattlesnakes are commonly found along the trail in Connecticut and have been reported, although rarely, as far north as New Hampshire. Other large mammals commonly sighted include deer; elk, reintroduced in the Smoky Mountains; and moose, which live as far south as Massachusetts but are more commonly seen in northern New England. No sub-alpine regions exist between Mount Rogers in Virginia and Mount Greylock in Massachusetts, mainly because the trail stays below 3,000 feet (910 m) from Shenandoah National Park in Virginia to Mount Greylock. Mount Greylock, however, has a large subalpine region, the only such forest in Massachusetts, extending down to 3,000 feet (910 m), which in the south would be far from the sub-alpine cutoff. This is especially low because Greylock is exposed to prevailing westerly winds, as the summits along its ridgeline rise approximately 200 to 650 feet (61 to 198 m) higher than any other peak in Massachusetts. Farther north, several peaks in Vermont reach into the sub-alpine zone, the bottom of which steadily descends as one proceeds northward, so that by the White Mountains in New Hampshire, it often occurs well below 3,000 feet (910 m). At Mount Moosilauke, which summits at 4,802 feet (1,464 m), the first alpine environment on the trail is reached, where only thin, sporadic flora is interspersed with bare rocks. Between the two regions is the krummholz region, where stunted trees grow with their branches oriented away from the winter's prevailing northwest wind, thus giving the appearance of flags (they are often called "flag trees"). This region resembles lowland terrain hundreds of miles north in Canada. It also contains many endangered and threatened species. The trail has been rerouted over New Hampshire's Presidential Range so the Appalachian Mountain Club can protect certain plant life. The alpine cutoff in the Whites is generally between 4,200 and 4,800 feet (1,300 and 1,500 m). Mountains traversed by the A.T. above treeline include Mount Moosilauke, several miles along the Franconia Range and along the Presidential Range. In the Presidentials, the trail climbs as high as 6,288 feet (1,917 m) on Mount Washington and spends about 13 miles (21 km) continuously above treeline, in the largest alpine environment in the United States east of the Rocky Mountains. Panoramic image of the Catawba Valley from the McAfee Knob overlook. As the Appalachian Trail was explicitly designed to be hiked, it includes resources to facilitate hikers. Some are common to trails throughout North America, while some are unique to the Appalachian Trail. The trail is much more frequently hiked south to north (that is, Georgia to Maine) than vice versa. Hikers typically begin in March or April and finish in late summer or early to late fall of that particular year. Bicycles and wheeled conveyances are prohibited from the trail except for the sections which follow the C&O Canal in Maryland and the Virginia Creeper Trail in Virginia. Horses and pack animals are prohibited except horses on the C&O Canal and in the Great Smoky Mountains National Park. Throughout its length, the AT is marked by 2 by 6 inches (5 by 15 cm) white paint blazes. 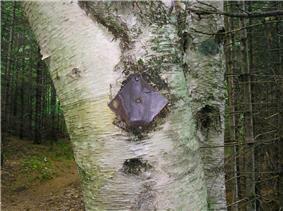 Side trails to shelters, viewpoints and parking areas use similarly shaped blue blazes. 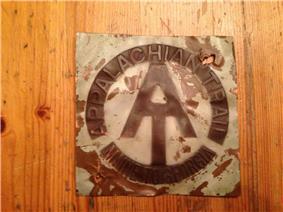 In past years, some sections of the trail also used metal diamond markers with the AT logo, few of which survive. Most hikers carry a lightweight tent, tent hammock or tarp. The trail has more than 250 shelters and campsites available for hikers. The shelters, sometimes called lean-tos (in Maine, Massachusetts, and Connecticut), huts (in Shenandoah National Park), or Adirondack shelters, are generally open, three-walled structures with a wooden floor, although some shelters are much more complex in structure. Shelters are usually spaced a day's hike or less apart, most often near a water source (which may be dry) and with a privy. They generally have spaces for tent sites in the vicinity as the shelters may be full. The Appalachian Mountain Club (AMC) operates a system of eight huts along 56 miles (90 km) of New Hampshire's White Mountains. These huts are significantly larger than standard trail shelters and offer full-service lodging and meals during the summer months. The Fontana Dam Shelter in North Carolina is more commonly referred to as the Fontana Hilton because of amenities (e.g. flush toilets) and its proximity to an all-you-can-eat buffet and post office. Several AMC huts have an extended self-service season during the fall, with two extending self-service seasons through the winter and spring. 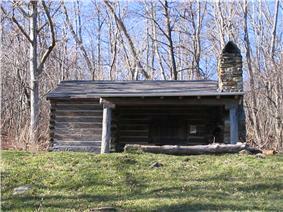 The Potomac Appalachian Trail Club maintains trail cabins, shelters, and huts throughout the Shenandoah region of Virginia. The section of the trail that runs through the Mid-Atlantic and New England states has a very high population of deer ticks carrying Lyme and other tick-borne diseases, and corresponds to the highest density of reported Lyme Disease in the country. Poison ivy is common the length of the trail, and more plentiful in the South. Hiking season of the trail generally starts in mid-to-late spring, when conditions are much more favorable in the South. However, this time may also be characterized by extreme heat, sometimes in excess of 100 °F (38 °C). Under such conditions, hydration is imperative. Light clothing and sunscreens are a must at high elevations and areas without foliage, even in relatively cool weather. Further north and at higher elevations, the weather can be cold, characterized by low temperatures, strong winds, hail or snow storms and reduced visibility. Prolonged rain, though not typically life-threatening, can undermine stamina and ruin supplies. Mittlefehldt, Sarah (2013). Tangled Roots: The Appalachian Trail and American Environmental Politics. Seattle, WA: University of Washington Press. ATC's official annual Appalachian Trail guide is the Appalachian Trail Thru-Hiker's Companion, compiled and updated by volunteers of the Appalachian Long Distance Hikers Association (ALDHA) (available at AppalachianTrail.org). Individual state guides and maps are also available via the ATC. The Official AT Databook, an annually updated compilation of trail mileages, water sources, road crossings, shelter locations, and other information. The 2015 DataBook is the 37th annual edition, is considered indispensable by many AT hikers, and the data published within is used by many other hiking guides. ^ a b c d Applebome, Peter (May 31, 2010), "A Jolt of Energy for a Much Trod-Upon Trail". New York Times. p. 14. ^ Appalachian Trail | Dropping In. OutsideOnline.com. Retrieved on 2013-08-02. 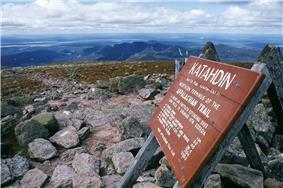 ^ White Mountain Huts - NH Appalachian Trail Lodging - Appalachian Mountain Club. Outdoors.org (2012-04-03). Retrieved on 2013-08-02. ^ "History" AppalachianTrail.org (accessed June 24, 2008). ^ "Explore the Trail: Georgia" AppalachianTrail.org (accessed September 11, 2006). ^ "Explore the Trail: North Carolina" AppalachianTrail.org (accessed September 11, 2006). ^ http://www.appalachiantrail.org/c.jkLXJ8MQKtH/b.774897/k.F7EB/_Tennessee.htm "Explore the Trail: Tennessee" AppalachianTrail.org (accessed September 11, 2006). ^ "Explore the Trail: West Virginia" AppalachianTrail.org (accessed September 11, 2006). ^ "Explore the Trail: Maryland" AppalachianTrail.org (accessed September 11, 2006). ^ "Terrain By State: Pennsylvania" AppalachianTrail.org (accessed May 23, 2015). ^ "Terrain By State: New Jersey" AppalachianTrail.org (accessed May 21, 2015). ^ "Terrain By State: New York" AppalachianTrail.org (accessed June 24, 2013). ^ "Explore the Trail: Connecticut" AppalachianTrail.org (accessed September 11, 2006). ^ "Explore the Trail: Massachusetts" AppalachianTrail.org (accessed September 11, 2006). ^ "Explore the Trail: Vermont" AppalachianTrail.org (accessed September 11, 2006). ^ "Explore the Trail: New Hampshire" AppalachianTrail.org (accessed September 11, 2006). ^ "Explore the Trail: Maine AppalachianTrail.org(accessed August 11, 2010). ^ "Explore the Trail: Maine" AppalachianTrail.org (accessed September 11, 2006). Behavioral studies have also been conducted on hikers themselves. A 2007 study on hikers found that most persons hike the trail "for fun and enjoyment of life and for warm relationships with others" and that "environmental awareness, physical challenge, camaraderie, exercise, and solitude" were chief results among hikers. Since the highest single demographic of thru-hikers are males between the ages of 18–29, one informal study sought to find the correlation between this group and male college drop-outs. In some parts of the trail in Maine, such as Mahoosuc Notch, even the strongest hikers may only average 1 mile per hour (1.6 km/h). There are other parts in which hikers must hold on to tree limbs and roots to climb and descend, which are especially dangerous and hazardous in wet weather conditions. Vermont has 150 miles (240 km) of the trail. Upon entering Vermont, the trail coincides with the southernmost sections of the generally north/south-oriented Green Mountains, summitting such notable peaks as Stratton Mountain, Glastenbury Mountain, and Killington Peak. After parting ways with the Long Trail at Maine Junction, the AT turns in a more eastward direction, crossing the White River, passing through Norwich, and entering Hanover, New Hampshire, as it crosses the Connecticut River. The Green Mountain Club maintains the AT from the Massachusetts state border to Route 12. The Dartmouth Outing Club maintains the trail from VT Route 12 to the New Hampshire state line. Massachusetts has 90 miles (140 km) of trail. The entire section of trail is in western Massachusetts' Berkshire County. It summits the highest peak in the southern Taconic Range, Mount Everett (2,604 feet (794 m)), then descends to the Housatonic River valley and skirts the town of Great Barrington. The trail passes through the towns of Dalton and Cheshire, and summits the highest point in the state at 3,491 feet (1,064 m), Mount Greylock. It then quickly descends to the valley within 2 miles (3.2 km) of North Adams and Williamstown, before ascending again to the Vermont state line. 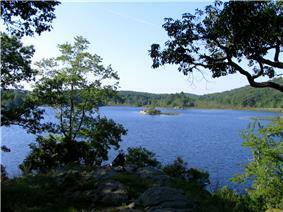 The trail throughout Massachusetts is maintained by the Berkshire Chapter of the Appalachian Mountain Club. New York's 88.4 miles (142.3 km) of trail contain very little elevation change compared to other states. From south to north, the trail summits many small mountains under 1,400 feet (430 m) in elevation, its highest point in New York being Prospect Rock at 1,433 feet (437 m), and only 3,000 feet (910 m) from the border with New Jersey. The trail continues north, climbing near Fitzgerald Falls, passing through Sterling Forest, and then entering Harriman State Park and Bear Mountain State Park. 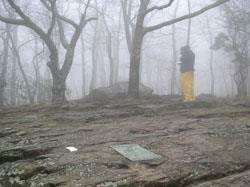 The lowest point on the entire Appalachian Trail is in the Bear Mountain Zoo 124 feet (38 m). 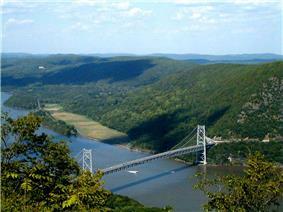 It crosses the Hudson River on the Bear Mountain Bridge. It then passes through Fahnestock State Park, and continues northeast and crosses the Metro-North Railroad's Harlem Line. This track crossing is the site of the only train station along the trail's length. It enters Connecticut via the Pawling Nature Reserve. The section of the trail that passes through Harriman and Bear Mountain State Parks is the oldest section of the trail, completed in 1923. A portion of this section was paved by 700 volunteers with 800 granite-slab steps followed by over a mile of walkway supported by stone crib walls with boulders lining the path. The project took four years, cost roughly $1 million, and was officially opened in June 2010. The project was done by the New York–New Jersey Trail Conference. The New York–New Jersey Trail Conference maintains and updates the Appalachian Trail in New York. New Jersey is home to 72.2 miles (116.2 km) of the trail. The trail enters New Jersey from the south on a pedestrian walkway along the Interstate 80 bridge over the Delaware River, ascends from the Delaware Water Gap to the top of Kittatinny Mountain in Worthington State Forest, passes Sunfish Pond (right), continues north through the Delaware Water Gap National Recreation Area and Stokes State Forest and eventually reaches High Point State Park, the highest peak in New Jersey (a side trail is required to reach the actual peak). It then turns in a southeastern direction along the New York border for about 30 miles (48 km), passing over long sections of boardwalk bridges over marshy land, then entering Wawayanda State Park and then the Abram S. Hewitt State Forest just before entering New York near Greenwood Lake. In New Jersey the New York - New Jersey Trail Conference maintains and updates the Appalachian Trail. Pennsylvania has 229.6 miles (369.5 km) of the trail. The trail extends from the Pennsylvania – Maryland line at Pen Mar, a tiny town straddling the state line, to the Delaware Water Gap, at the Pennsylvania – New Jersey border. The Susquehanna River is generally considered the dividing line between the northern and southern sections of the Pennsylvania AT, south of the Susquehanna, the trail passes through Pine Grove Furnace State Park. This Pennsylvania section of the trail, particularly from Duncannon until the Delaware Water Gap, is noted for its eroded and rocky terrain which can slow hiking. Maryland has 41 miles (66 km) of the trail, with elevations ranging from 230 to 1,880 feet (70 to 573 m). Hikers are required to stay at designated shelters and campsites. The trail runs through the eastern edge of Greenbrier State Park. This can serve as a luxurious stop point for a hot shower and a visit to the camp store. The trail runs along the C&O Canal Towpath route for 3 miles (4.8 km). Hikers will also pass High Rock, which offers spectacular views and is a popular hang-gliding site. The section ends at Pen Mar Park, which sits on the border of Maryland and Pennsylvania. West Virginia has 4 miles (6.4 km) of the trail, not including about 20 miles (32 km) along the Virginia border. Here the trail passes through the town of Harpers Ferry, headquarters of the Appalachian Trail Conservancy. Harpers Ferry is what many consider to be the mental midpoint of the entire A.T., although the actual midpoint exists a few miles north in Pennsylvania. Virginia has 550 miles (890 km) of the trail, by far the longest of any state, including about 20 miles (32 km) along the West Virginia border. With the climate, and the timing of northbound hikers, this section is wet and challenging because of the spring thaw and heavy spring rainfall. Substantial portions closely parallel the Blue Ridge Parkway and, in Shenandoah National Park, Skyline Drive. Parts of the trail near the Blue Ridge Parkway and the Skyline Drive are often considered the best for beginner hikers. In the southwestern portion of the state, the trail goes within one half mile of the highest point in Virginia, Mount Rogers, which is a short side-hike from the AT. North Carolina has 88 miles (142 km) of the trail, not including more than 200 miles (320 km) along the Tennessee Border. Altitude ranges from 1,725 to 5,498 feet (526 to 1,676 m). The trail enters from Georgia at Bly Gap, ascending peaks such as Nantahala River crossing. Up to this point, the trail is maintained by the Nantahala Hiking Club. Beyond this point, it is maintained by the Smoky Mountains Hiking Club. 30 miles (48 km) further north, Fontana Dam marks the entrance to Great Smoky Mountains National Park. Georgia has 75 miles (121 km) of the trail, including the southern terminus at Georgia Peaks on the Appalachian Trail. 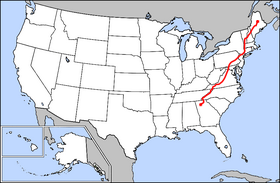 The Appalachian Trail, the  In 2001, Brian Robinson became the first one to complete all three trails in a year. In 2015, Heather Anderson (trail name "Anish") became the first woman to hold the unsupported record on the Appalachian Trail and the Pacific Crest Trail simultaneously. Part of hiker subculture includes making colorful entries in logbooks at trail shelters, signed using pseudonyms called "trail names". Thru-hikers are classified into many informal groups. "Purists" are hikers who stick to the official AT trail, follow the white blazes, except for side trips to shelters and camp sites. "Blue Blazers" cut miles from the full route by taking side trails marked by blue blazes. The generally pejorative name "Yellow Blazers," a reference to yellow road stripes, is given to those who hitchhike to move either down or up the trail. The current speed record for a supported thru-hike of the AT was set by Scott Jurek in 2015, at 46 days, 8 hours, and 7 minutes. Jurek made the trip northbound, from late May to mid-July. The current speed record for a self-supported (meaning no vehicle or crew support) thru-hike was set by Matthew Kirk in 2013, at 58 days, 9 hours, and 40 minutes. Kirk's hike was completed in a southbound direction from mid June to early August. Historically, only about 10% to 15% of those who make the attempt report to the Appalachian Trail Conservancy that they completed it. However, since 2001, the number of people starting out in Georgia to do a thru-hike (or at least registering to do so) has dropped considerably, yet the number of people reporting that they have completed a thru-hike has remained approximately the same. This has resulted in an apparent increase in the completion rate to 29% (as of 2006). "; those who traverse the trail during a series of separate trips are known as "section-hikers". Rugged terrain, weather extremes, illness, injury, and the time and effort required make thru-hiking difficult to accomplish. thru-hikersTrail hikers who attempt to complete the entire trail in a single season are called "
In March 2015, a hiker was killed on the trail in Maryland when a large tree blew over and fell onto him.